The crest is designed in the form of a St. Andrew's Cross with an insignia in each of the four corners. The "X" at the centre, the first letter of the Greek word for Christ, is a traditional symbol for Christ. In the four corners of the crest are symbols, three of which are particularly associated with the three communions—Congregational, Methodist, and Presbyterian—that united to form The United Church of Canada in 1925. • The open Bible represents the Congregational Churches with their emphasis upon God's truth that makes people free. From this communion we have a heritage of liberty in prophesying, love of spiritual freedom, awareness of the creative power of the Holy Spirit, and clear witness for civic justice. • The dove is emblematic of the Holy Spirit (Mark 1:10) whose transforming power has been a distinctive mark of Methodism. Here our heritage is one of evangelical zeal, concern for human redemption, warmth of Christian fellowship, the testimony of spiritual experience, and the ministry of sacred song. • The burning bush is the symbol of Presbyterianism. It refers to the bush that burned and was not consumed (Exodus 3:2), and symbolizes the indestructibility of the church. From Presbyterianism we have received a heritage of high regard for the dignity in worship, the education of all people, the authority of scripture, and the church as the Body of Christ. • The symbols alpha and omega in the lower quarter are the first and last letters of the Greek alphabet. They symbolize the eternal living God, in the fullness of creation (Revelation 1:8). "Akwe Nia'Tetewá:neren," which means "all my relations." 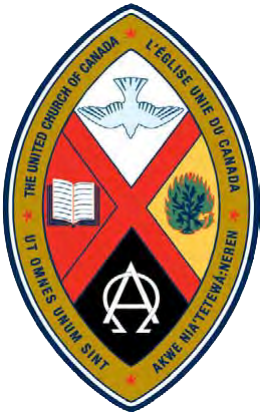 The new design of The United Church crest.